Fans and friends pay their respects to legendary actor John Hurt, who passed away at 77. 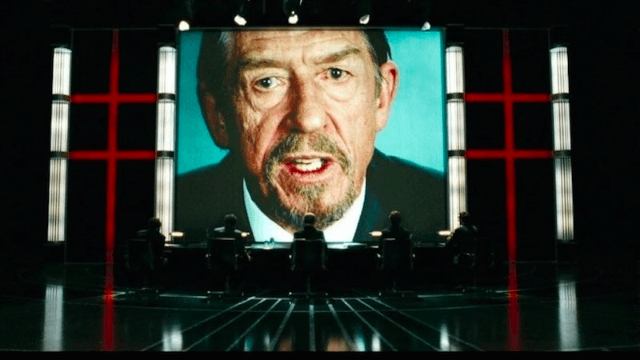 In a week that saw George Orwell's 1984 rocket to the top of the Amazon charts thanks to our "alternative fact"-based presidential administration, the star of the dystopian novel's screen adaptation, Sir John Hurt, died at the age of 77. It was terribly sad today to learn of John Hurt's passing. He was a truly magnificent talent. Among his many acclaimed roles in a long and storied career were Caligula in I, Claudius, the title part in David Lynch's The Elephant Man, and turns in the more recent Snowpiercer and Tinker Tailor Solider Spy. He also notably portrayed Mr. Ollivander, owner of the wand shop in the Harry Potter series. In remembrance, fans raised their wands to the store at the Wizarding World of Harry Potter theme parks in Orlando and Hollywood. Hurt was also the first victim of a certain notorious chest-bursting life-form in the sci-fi/horror film Alien, acting the hell out of an instantly iconic scene that he would later reenact for Mel Brooks in the decidedly less serious Spaceballs. Hurt, who was also an accomplished stage actor and lent his voice to the 1970s animated classics Watership Down and The Lord of the Rings, was working up until the end, filming a movie with Gary Oldman about the early days of World War II. He had been battling pancreatic cancer since 2015. "I can't say I worry about mortality, but it's impossible to get to my age and not have a little contemplation of it," he said of his illness to the Radio Times. "We're all just passing time, and occupy our chair very briefly." True, but we would've been glad to see him sit a good while longer.